On the 15th. 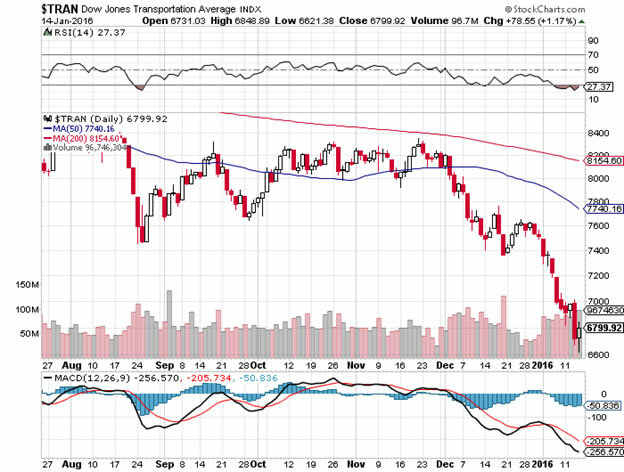 of December last we noted that the Dow Transports had given a re-confirmed bear signal and accordingly we advised caution. Since then the Dow Industrials have fallen 989 points (approx). The Industrials need to break the 15,750 level for a full bear market to be re-confirmed. Based on yesterday’s price action, in all probability, this will happen sooner rather than later. 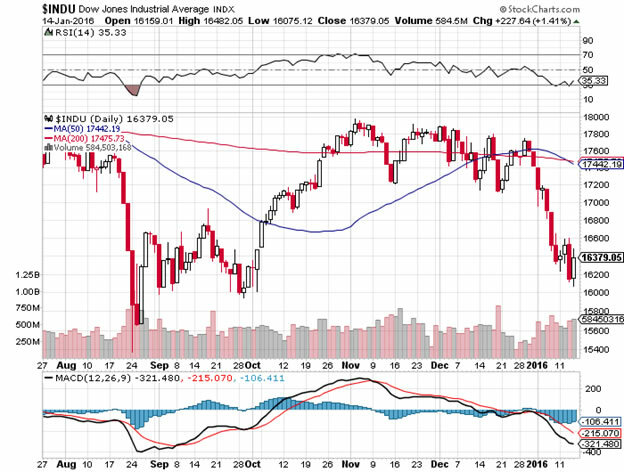 (Remember our initial Dow Theory sell signal was triggered January 2015). Based on “classic” market analysis once the 15,750 level is broken the next price point will be 15,400 then 14,750. If the 14,000 level is violated on high volume, this bear market will gain real momentum but should find significant support at the 10,800/9,800 price arena. Thus we believe a “correction” of approximately 33%, from present market levels, is very possible over the next 12 -18 months. Chart: Dow Jones Transports: Daily. In a recent TV interview Donald Trump explained how in order to bring America back to its former glory he wished to stop the “off-shoring” of jobs to China and bring true manufacturing back to American cities. Citing his plans he explained that what had originally made the “American Dream” were, among others, people like Henry Ford who gave lifelong employment to men earning excellent wages which enabled them to marry, buy a home, educate a family and retire in dignity with adequate healthcare. For many years this is a topic I have personally written on and I was delighted to hear Trump talk passionately about the issue. In order to understand its significance let us look at what Henry Ford actually did. In the 1920’s he completely redefined "classical" economics through the policies undertaken by the Ford Motor Company. How did he do this? Under "normal" economic theory it was assumed that a corporation could only maximise profits by ideally becoming a monopoly which meant increasing prices and limiting supply. Ford did the exact opposite. He had a more holistic view of the role of the corporation in society. He understood the synergetic relationship between money and goods. Accordingly, he doubled the wages of his workers and decreased the price of the Model T. In the process remade the Ford Motor Corporation and remade America. (This policy was not inflationary because he knew he could at least double production through increased efficiencies when he doubled wages). As a result The Ford Company boomed. How did this happen? It was axiomatic because he understood the importance of money and purchasing power in a community. With "high" wages Ford's workers were able to make a good living and have excess funds to save or spend. Their financial anxiety ceased and staff turnover dropped by a multiple of five in one year. This dramatically decreased management expense and increased productivity. With the increased disposable income in the Detroit area the general economy boomed. All classes of economic sectors expanded. As a result more workers, new business owners, company managers, insurance brokers, real estate brokers, bankers, salesmen, craftsmen, delivery men, builders, farmers and retailers all could afford Ford cars. Demand for the model T exploded through the increased buying power. Ford had realised that without money there was no purchasing power and without purchasing power there was no effective demand. This policy built up the economy of Detroit and it helped define America as a country where a factory worker was respected and well paid, not exploited, as had been the case throughout the English industrial revolution and is the case now. The "American Dream" was Ford’s vision made manifest. It was a dream brought to fruition not through political fantasy but through the hard laws of economics, accounting, finance, production, distribution and marketing. Let us hope Trump is successful in getting this message across to the wider political and business class for without full access to “real jobs paying real wages” America will never be great again.